Be the first to share your favorite memory, photo or story of Vivian . This memorial page is dedicated for family, friends and future generations to celebrate the life of their loved one. 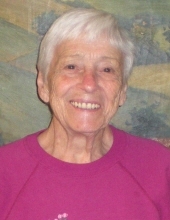 Vivian Gardner, 94, passed away April 7, 2019, at Sierra Ridge Memory Care in Auburn, California. She was born in Salt Lake City on September 23, 1924, to Lincoln and Julia (Falkner) Holley. When she was two years old, her family moved to Ruth, NV, where her father worked in the local mine. She attended grade school in Ruth and White Pine High School in Ely. She married Wayne Prince in February 1943. Her daughter, Katherine, was born in November 1943. She and her daughter moved to the Bay Area where she worked in the shipyard in Richmond as a welder. After her divorce from Wayne, she married Martin “Mack” Gardner. Their son, Douglas, was born in February 1947. In 1967, after the children had graduated and moved on, Vivian and Mack moved from Martinez to Alta California. Vivian worked various jobs through the years and especially liked volunteering for the Alta Fire Dept. thrift store. She was active in the Colfax ward of the Church of Jesus Christ of Latter-day Saints. She is preceded in death by Mack, her husband of 39 years; her parents; her brothers, Lincoln “Bud” Holley and Dough Holley; her sisters, Juanita Damele and Ellen Damele; and her son-in-law, Jim McCarthy. She is survived by her daughter, Katherine McCarthy; her son, Douglas Gardner (Deborah); five grandchildren; eleven great-grandchildren; and three great-great grandchildren. Funeral arrangements are through Lassila Funeral Chapel in Auburn. Burial will be next to her husband in the Colfax, California Cemetery. Vivian’s family would like to thank the staff at Sierra Ridge Memory Care in Auburn for the four years of kind and loving care they gave to Vivian. The family would also like to thank Bristol Hospice of Roseville, and her physician, Dr. Kurtis Fox in Colfax. To send flowers or a remembrance gift to the family of Vivian Gardner, please visit our Tribute Store. "Email Address" would like to share the life celebration of Vivian Gardner. Click on the "link" to go to share a favorite memory or leave a condolence message for the family.